Updated Sunday October 9, 2016 by AUBL Miami. 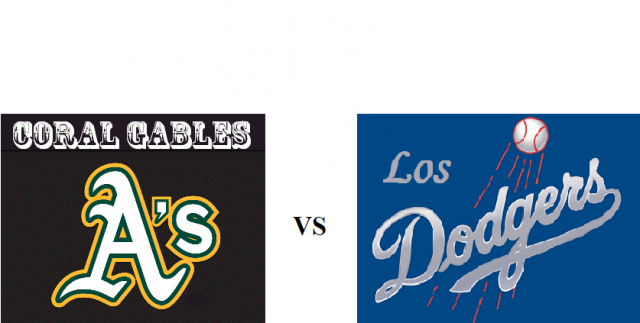 Special event broadcast game of the week Coral Gables A's vs Los Dodgers Sunday 10/9/16 at 6:30 pm from South Dade High School. Both teams NEED to win this game!! For The Coral Gables A's, this game could be the difference between finishing 2nd or 6th in a very tight National League Division. If The A's finish 2nd, they will earn a 1st round playoff bye. If The A's finish 6th, they will play the 3rd place team in the 1st round. Currently, the 3rd place team is The Miami Storm, who defeated the A's 6-2 in their prior meeting this season. For Los Dodgers, it is very simple. Win this game and keep playoff hopes alive.